Do you want know what the dodo ate? So do we! Contrary to popular belief, we are only just beginning to understand the dodo’s lifestyle. Out of all of the questions we have, finding out how the dodo evolved and used its peculiar skull is our top priority. Why and how did the dodo develop such a unique skull? This project is to fund research travel to Mauritius to create the first biomechanical model of the dodo skull and to develop further outreach activities for the Mauritian public. The dodo, Raphus cucullatus, was a giant pigeon once native to the isle of Mauritius. It became extinct only 400 years ago when humans colonized the island. Unfortunately, it can’t seem to shake its image of a fat, clumsy bird that was destined for extinction. Our research shows that quite the opposite was true. Paleontological and geological analysis of the dodo mass grave Mare aux Songes shows that dodos were able to survive extreme climatic events, such as extreme droughts. Preliminary results of our anatomical study of the Port Louis dodo specimen suggests that the dodo was highly adapted to Mauritius’ unique ecosystem. We will gather data that will be incorporated in the first biomechanical model of the dodo skull. This will help us to reconstruct what, and how, the dodo ate. In 2011, at the start of our investigation of the exceptional dodo skeleton on display in the Port Louis Museum in Mauritius, we made a 3-D laser surface scan of the complete skeleton. However, to fully understand how the dodo skull worked, we need to capture new information that is critical to reconstructing the forces that the jaw muscles generated, and to model the stresses that the dodo jaws could withstand. Knowing what the dodo ate, and how, is of fundamental importance to understanding its place in the Mauritian ecosystem and the forces that may have contributed to its ultimate demise. With this project, we aim to capture crucial details of the dodo skull that laser surface scanning was not able to detect and record before, including obstructed muscle insertions and blocked articular surfaces that are paramount for modeling dodo jaw mechanics and feeding behaviour. This project will primarily fund travel costs of members of the Dodo Research Programme to Mauritius to make the very first biomechanical model of the dodo skull. Secondly, it will fund material costs of an infographic module (3D printing of the skull and production costs) for the Port Louis Natural History Museum, to share knowledge of their famous extinct bird with the public. There is an 8% website service charge fee levied by Experiment, but the rest of your donation will go directly to our research. Any excess funds of this campaign will be donated to Dodo Alive, our non-profit foundation to fund further research on the dodo and its ecosystem. Leon Claessens is an Associate Professor of Biology at the College of the Holy Cross in Worchester, Massachussets. Leon has worked extensively on bird anatomy and is proud father of the website Aves3D where you can admire bird skeletons in 3D. Hanneke Meijer is a Postdoctoral Fellow at the Institut Catala de Paleontologia in Barcelona, Spain. Hanneke is a bird paleontologist and has worked on fossil birds from the Mediterranean, Indonesia and Mauritius. Hanneke tweets about her research at @DrHanneke. 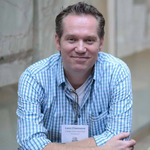 Kenneth Rijsdijk is Researcher at the University of Amsterdam, the Netherlands. Kenneth is a geologist, and re-discovered the Mare aux Songes dodo mass grave in 2005 by accident while setting cores for pollen research. 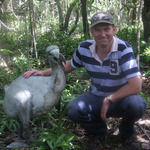 He set up the Dodo Research Programme and is also referred to as Chief Dodo. The dodo –just a big pigeon? A reconstruction of what a dodo looked 'in the flesh' made by Alexander Melville and Hugh Strickland in 1848, based on a dried head in the collection of the Oxford University Museum of Natural History. Leon Claessens scanned the only known complete skeleton of a single individual dodo in the Port Louis Natural History Museum on Mauritius.